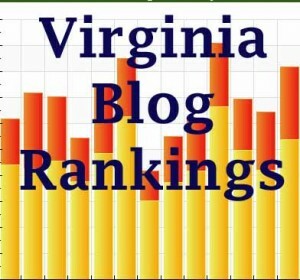 The Virginia Political Blog Rankings for 8/14/2011 – Right Leaning Blogs Win the Week with 55% Improving | Virginia Right! The Virginia Political Blog Rankings for 8/14/2011 are out! Several blogs (finally) took our advice and registered for Technorati and moved up quite a bit in the rankings as a result. This week’s Most Improved Virginia Political Blog Award goes to The Green Miles which rose 432% compared to the previous week and this translated to an upward move of 24 slots from #45 to #21. Green Miles was also one of three Blogs who were unlisted on Technorati last week and took the time to get listed (which is FREE and the information is available by clicking the BlogRank FAQ at the menu bar on this site). The other two blogs that listed on Technorati this week deserve Honorable Mention. They were Shaun Kenney who improved 132% over the previous week and rose from #22 to #11 as a result. Project Virginia is also one of the blogs that is now listed on Technorati and improved 71% over last week, moving from #20 to #15. The main goal of this weekly ranking is to promote Virginia Political Blogs and encourage bloggers to maximize their reach and voice in the political process. This is a non-partisan endeavor and will, hopefully, make Virginia a larger player in the US Political arena. A number of bloggers have used the tips in the BlogRank FAQ and have seen their standings in this ranking rise as a result. What has also happened is that their ranking on nearly all of the search engines has improved as a result of their efforts to list themselves in all of the ranking engines. Which translates to more reads and a larger voice in the process. We have reached the point where half of the Political Blogs in the state are listed in all of the ranking engines. What are the rest of you waiting for? This week, 18 out of 33 Right Leaning Blogs improved (55%) and 6 out of 17 Left leaning Blogs improved (35%). Overall, 24 out of 50 Virginia Blogs improved this week over last (48%). Bragging right for the week go to the Right Leaning Political Blogs! ← UKIP LEADERS URGE PETITION ON EU MEMBERSHIP!